A comprehensive collection of 8 books in 1 offering electronics guidance that can't be found anywhere else! If you know a breadboard from a breadbox but want to take your hobby electronics skills to the next level, this is the only reference you need.Electronics All-in-One For Dummies has done the legwork for you - offering everything you need to enhance your experience as an electronics enthusiast in one convenient place. 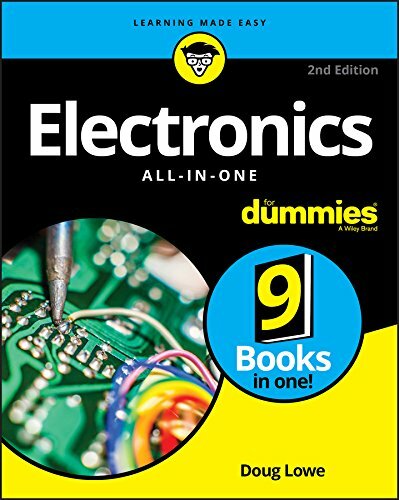 Written by electronics guru and veteran For Dummies author Doug Lowe, this down-to-earth guide makes it easy to grasp such important topics as circuits, schematics, voltage, and safety concerns. Plus, it helps you have tons of fun getting your hands dirty working with the Raspberry Pi, creating special effects, making your own entertainment electronics, repairing existing electronics, learning to solder safely, and so much more. If you're obsessed with all things electronics, look no further! This comprehensive guide is packed with all the electronics goodies you need to add that extra spark to your game! A comprehensive collection of 8 books in 1! Offers electronics guidance that can't be found anywhere else! This down-to-earth guide makes it easy to grasp such important topics as circuits, schematics, voltage, and safety concerns. Get your hands dirty working with the Raspberry Pi, creating special effects, making your own entertainment electronics, repairing existing electronics, learning to solder safely, and so much more. This comprehensive guide is packed with all the electronics goodies you need to add that extra spark to your game!